After twenty-­eight years as Artistic Director of the music festival he founded, Maestro Robert Olson will relinquish the baton at the end of the upcoming MahlerFest XXVIII, in May, 2015, with a farewell performance of Mahler’s last completed work, his Symphony No. 9 in D.
Since 1988, MahlerFest has been dedicated to the life, music, and times of Austro-­‐Bohemian composer Gustav Mahler. Robert Olson, who studied conducting in Vienna on a Fulbright scholarship, founded MahlerFest when, as a young CU music faculty member, he was inspired by the nearby Colorado mountains, having in mind the European Alps which inspired much of Mahler’s music. Olson wanted the festival to be multi-­‐faceted, with a series of events such as free chamber concerts, full orchestra concerts, film festivals, and free lectures by authorities on Mahler and his times. For MahlerFest I and II, Maestro Olson did everything himself: recruiting orchestra and choral members, soloists, lecturers, writing press releases, and printing the program book … even turning the stage lights off! 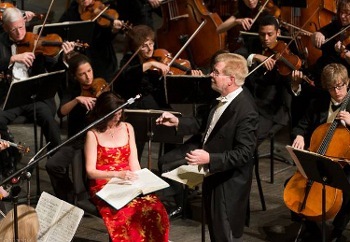 Under Maestro Olson’s artistic direction, MahlerFest has grown to be a week-­‐long festival, which has gained international recognition, attracting scholars and performers world-­‐wide. In 2005, the International Gustav Mahler Society of Vienna awarded its rarely bestowed Mahler Gold Medal to Colorado MahlerFest. The Colorado MahlerFest Board of Directors will announce the name of the new Artistic Director at the MahlerFest concerts on May 16/17, 2015. 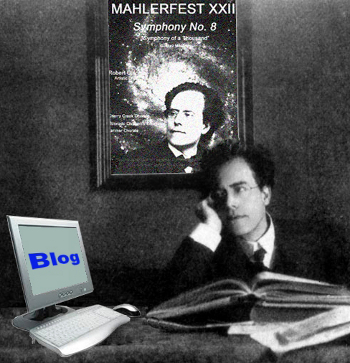 This entry was posted in MahlerFest, Ron Nadel, Uncategorized and tagged Gustav Mahler, Mahler, mahler's 9th, Robert Olson. Bookmark the permalink.